Click to Join my guitar mastery club now! Why you are NEVER too old to learn the guitar! Playing in a band requires a different skill set from playing solo guitar. You need to listen to the musicians around you. 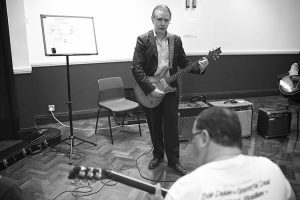 Why you need a great guitar instructor! By working alongside a great guitar instructor, your guitar playing will develop much faster than learning by yourself. How to practice the guitar without having a guitar on you! Did you know that you can make tremendous progress in your guitar journey by practicing without a guitar? If you really want to EXCEL at your guitar playing, then the key lies in being a great guitar student. In this video, Stefan Joubert discuss the vital aspect of how to select your guitar teacher in London.